best tank design ever within its era. Period. Perhaps a diesel might have been available earlier. But still. The Germans would have had even more late war headaches if this beast entered Western Front earlier. Perhaps Berlin would have been British! heyhey there would be no discussions, no polls. the Centurion would have been the tank of the 20thcentury. In fact it is, but people tend to disregard all post-WWII conflicts when it comes to armour. I always liked the Centurion, built a few models of them when I was a kid. Good also that somewhere, they are still doing the job. I mistakenly thought that those yet in service were in the old configurations, mostly because any time the U.S. makes significant changes in a vehicle, they give it a new M number. Britain just adds Mk's and No. 's to them keeping the original name. Still like the Cent in all of it's iterations. Last edited by tankgeezer; 09-13-2016 at 10:37 PM. I was Infantry in the Brit Army of the 1960s. We were given a very entertaining briefing by an RAC officer in Colchester. Film show and all - we wished all our training was as enjoyable. He described the Chieftain as an OK tank, but reserved his highest praise for the Centurion. (I think we were at Mk 11 or somesuch by then.) After treating all our technical questions with airy disinterest, he informed us that the immersion heater was excellent. Oh - and it was roomy enough for the whole crew to sleep in. Such peripheral considerations as speed, armament, climbing ability, armour protection were barely mentioned. Your posts reminded me of a couple of my own encounters with Centurions which I thought I'd recount here if you'll indulge me. Our company was advancing on foot across ploughed fields on Salisbury Plain one, soggy November. Trying to keep to the timetable, but delayed by the clinging mud which refused to be shaken off. The Squadron Commander of the Centurions which were accompanying us asked if we would like a lift. A few days previously he had us join in a sprint race against his guys, we on foot, they, in their vehicles – we were sore losers and he wasn’t very high on our like-list. However, he now redeemed himself hugely. Our rain-sodden bods clambered aboard and settled down on the engine louvres behind the turret. It was fantastic. The heat rising from the louvres soon dried us out – it was the first time we had felt warm in a week. Typically, it had been raining none stop for days and all our kit, sleeping bags, the lot, was soaked through. Unfortunately, we reached a jumping off point where we had to continue onto the objective by foot in support of the tangos. The going was a little easier as we followed their tracks. However, the memory of the warm comfortable ride stayed with me and I developed a great affection for the Centurion. When the Chieftain came along I remained loyal to the Centurion, stating to the sprogs that it was the best thing since sliced bread. A few years later, at BATUS, we were dug-in in a defensive sack waiting to be attacked. We could hear the radios of the D.S. standing about behind us as the battle picture began to build up. We were a part of an infantry combat team in support of an armoured battle group. We had Chieftains interspersed between rifle sections (squads) and out on the forward left-flank were two, Chieftain sniper-tanks. Way out ahead of us were targets for the tangos which consisted of decommissioned Centurions. We could hear the radioed contact reports of Tango 11 Alpha and Tang 11 Charlie reporting the advance of the forward elements of enemy armour – ‘Wait out!’ We saw the tracer rounds flying down the range before we heard the booming report of their main armaments. One of the target's turret, 12 tons I believe, was blown meters into the air, it was - WOW! Then the sniper tanks withdrew and joined us, hull-down, in the main defensive position. The enemy attacked in regimental strength, the Chieftains were blasting them to buggery. 105mm self-propelled guns were firing fixed-fire missions over our heads covering the area with air bursts. Enemy APC’s were approaching we blasted them with shoulder launched rockets, some enemy managed to de-bus, we engaged with rifle and machine gun. We won – end-ex! India 32Bravo had a new pin-up - the Chieftain! Last edited by 32Bravo; 09-15-2016 at 02:10 PM. About riding on tanks: One of our WOs on exercise in Berlin, hitched a lift on a French AMX-13 (or was it a -30? Not sure). Either way, time to debus and he had huge problems. As in, his DMS boot sole was heat-welded to the tank's exhaust pipe! Most embarrassing - all because he'd wanted to get his feet warm quickly. Australian Centurion tankies in Vietnam obviously went to a lot of trouble to get dressed up to meet General Westmoreland a few days after their Centurions were crucial in repelling enemy attacks on Australian positions at Coral, Balmoral and Coogee and in operations from those bases into enemy country and bunkers. 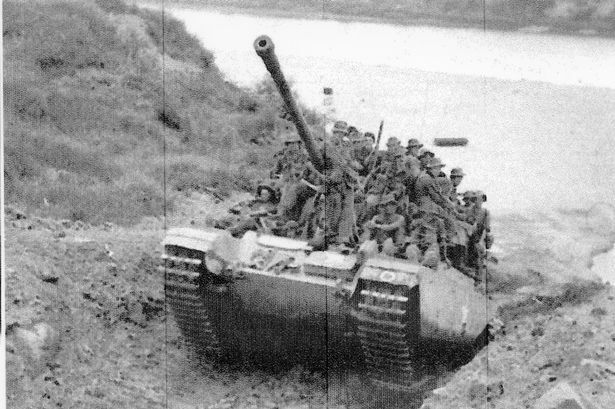 Operations are outlined at http://www.army.gov.au/Our-history/H...l-and-Balmoral , which show that Centurions were effective in jungle operations. Did they offer him some Tea? cents still had the boiler in them then right? "which show that Centurions were effective in jungle operations." A few things about that painting struck me as unlikely, so I looked it up to see what it was supposed to illustrate. "Diggers in Nam, Phuoc Tuy Province, South Vietnam, 5th - 7th June 1971 by David Pentland. The thing that struck me immediately was the turret machine gunner wearing the RAAC black beret and chrome badge. In the jungle; on operations; against the enemy? I wore that beret and badge in that era, although as cavalry rather than tanks, and wearing it in those circumstances went against every piece of training we got. As, possibly, does the cap worn by the bloke to his left (right of picture) which appears to have some sort of bright badge in the middle. Bags me being either of the other two blokes on the turret, who are much less likely to be the first target for a sniper. The lack of headgear on those actually involved in the operation in the following three photos is much more consistent with training and practice than the painting. Centurion in another operation in jungle in Vietnam. Bags me not being one of the blokes in front of the tank if it fires its main weapon. cents still had the boiler in them then right? They never let cavalry (i.e. mechanised infantry grunts) like me get anywhere near a tank, in case we infected or otherwise sullied it or its majestic crew with our inferior presence. See photo above with Gen Westmoreland for majestic tank crew and then imagine what we were like a long way down the scale of military magnificence. I did see a tank once during my brief service. It was in the Armoured Corps tank museum. I wasn't allowed to get close to that one, either. Just occurred to me that there are problems with that photo. Australian War Memorial caption says "A sharp eye is needed when moving through jungle such as this in South Vietnam. Sitting astride an Armoured Recovery Vehicle (ARV), his M60 machine gun close by, is Private (Pte) Frank Jelen of Fairfield, NSW, a member of the 3rd Battalion, The Royal Australian Regiment (3RAR). The ARV is followed by a Centurion tank. Australian soldiers of 3RAR and 4RAR combined with C Squadron, 1st Armoured Regiment, in Operation Overlord on the border of Phuoc Tuy and Long Khanh Provinces, to the north of the 1st Australian Task Force Base (1ATF) at Nui Dat." Why would a recovery vehicle be the lead vehicle in any offensive operation? Why would the M60 machine gunner on the recovery vehicle be facing the "following" Centurion? Surely he would be facing forward in the opposite direction if the recovery vehicle was in the lead. I reckon it's more likely that the Centurion is the lead vehicle with turret reversed in heavy country, and the recovery vehicle is following. Edit: The faint tracks don't decide it either way, as they're consistent with either vehicle being the lead vehicle. Last edited by Rising Sun*; 09-17-2016 at 07:50 AM. Tanks were not so majestic if you were in one, while not having to walk everywhere was a nice bonus, they were smelly, cramped,noisy, not at all comfortable, and could be very difficult for crew to escape from should the need arise. Not to mention that they were RPG(and pretty much anything else) magnets . And to add insult, the U.S. Tanks had no boiler to make coffee tea, or soup. The Heater exhaust pipe was good for heating, but we were never allowed to run them as that consumed too much diesel.